Monitor your home or business with the Pentabrid 16-Channel 8MP HD-CVI DVR with 4TB HDD & 12 5MP Outdoor Night Vision Turret Cameras from Dahua Technology. This DVR kit enables you to record from up to sixteen analog cameras. In addition, it has a 16-channel IP video input for network cameras up to 8MP. The included turret cameras transmit 2592 x 1944 resolution video at 20 fps. They are each equipped with a 2.8mm fixed lens that delivers a 103° horizontal field of view. The cameras have a built-in heater and are IP67 rated for outdoor use. 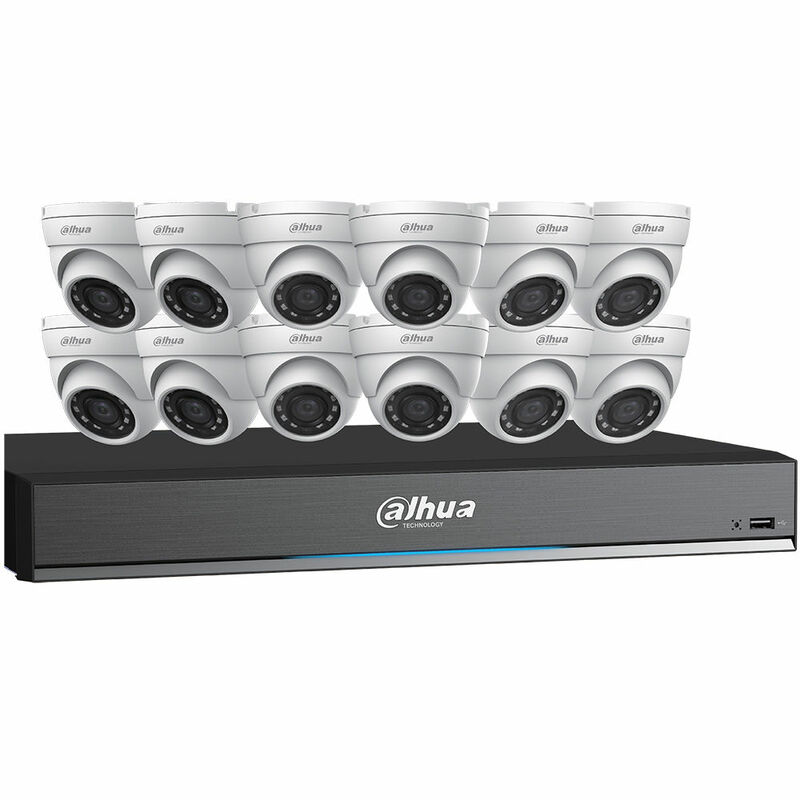 Stream and record up to 16 video channels with the X72A3A Pro Series Pentabrid HD-CVI DVR from Dahua Technology at resolutions up to 8MP. Equipped with two SATA ports, each supporting an HDD up to 10TB, this DVR can accommodate up to 20TB of HDD storage (4TB preinstalled). The recorder supports HD-CVI, AHD, HD-TVI, and SD analog cameras via its BNC interface. Additionally, it has a 16-channel IP video input for network cameras up to 8MP. With the help of H.265+, H.265, H.264+, and H.264 compression, file sizes are kept manageable while recording and playback quality are maintained. The DVR's interface includes RCA ports for two-way audio communication, as well as HDMI and VGA connections for video output with support for dual streaming to maximize bandwidth efficiency. The HDMI connection can output up to 4K UHD resolution video. The A511K02 5MP Outdoor HD-CVI Turret Camera from Dahua Technology uses a 1/2.7" progressive scan CMOS sensor to transmit 2592 x 1944 resolution video at 20 fps. Twelve IR LEDs provide up to 98' of night vision. The camera's 2.8mm fixed lens delivers a 103° horizontal field of view. HD-CVI, HD-TVI, AHD, and CVBS formats are supported. This camera is equipped with a built-in heater. It is housed in an IP67-rated aluminum enclosure that is suitable for outdoor use. Box Dimensions (LxWxH) 16.9 x 14.2 x 5.5"